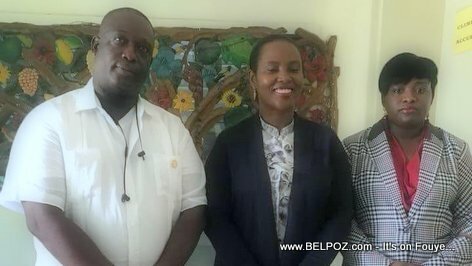 On Sunday, August 12 2018, Haitian first lady Martine Moise, accompanied by Croix-des-Bouquets Vice Delegue Gariga Narcisse visited 22-year-old Haitian mother Camicile Doresca who gave birth to 4 babies in Fonds-Parisien. The first lady came bearing gifts to the young mother who solicited her assistance. Video discours du Président Jovenel Moise lors de la cérémonie de présentation officielle du nouveau Premier ministre Henry Ceant. 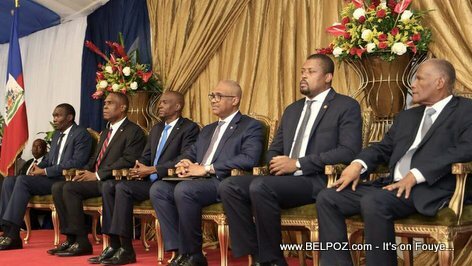 Senate President Joseph Lambert, New Haitian prime minister Jean-Henry Ceant, President Jovenel Moise, outgoing Prime Minister Jack Guy Lafontant, Chambre des Deputes president Gary Bodeau and Jules Cantave, president of the Conseil supérieur du Pouvoir judiciaire (CSPJ) at the official the official presentation ceremony of Prime Minister Jean Henry Ceant at the national palace Monday, August 07 2018. 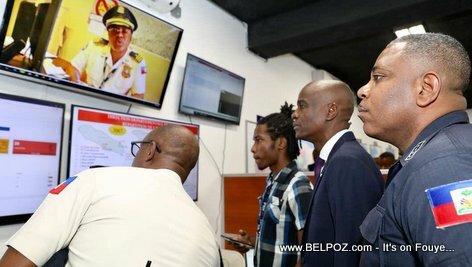 Here is a photo of Haitian president Jovenel Moise and his special adviser (Conseiller Spécial) Ardouin Zéphirin at the Direction générale de la Police nationale d'Haïti (PNH) during a visit Tuesday, July 31 2018. 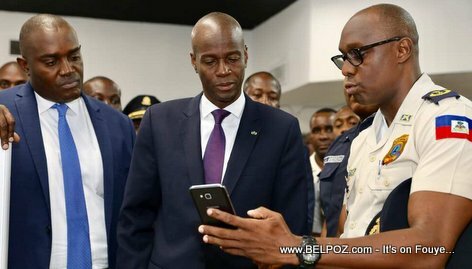 A member of the High command of the National Police of Haiti (Haut commandement de la Police Nationale d'Haïti) is seen here showing the president something on his cell phone. 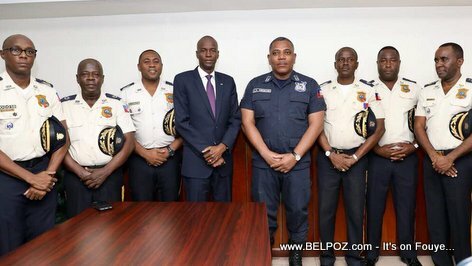 President Jovenel Moïse visited Police Chief Michel-Ange Gedeon (DG-PNH) and the High command of the National Police of Haiti (Le Haut commandement de la Police Nationale d'Haïti). 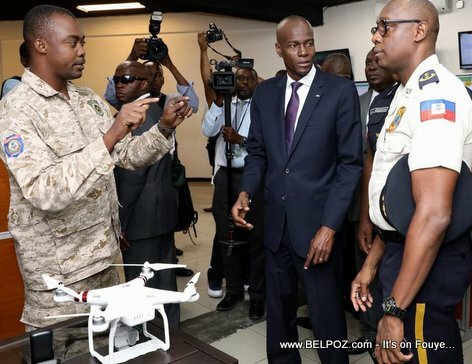 Here is a photo of Haitian President Jovenel Moise being shown a police drone at the Direction générale de la Police nationale d'Haïti (PNH) Tuesday, July 31 2018 during a visit. 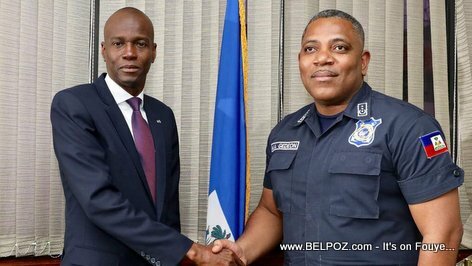 President Jovenel Moïse took some time to visit Police Chief Michel-Ange Gedeon (DG-PNH) and the High command of the National Police of Haiti (Le Haut commandement de la Police Nationale d'Haïti). PHOTO: Haiti President Jovenel Moise at the Beach - Un président à la plage! This photo of Haitian president Jovenel Moise at the beach had the critics buzzing. Can you guess why they were criticizing the president? 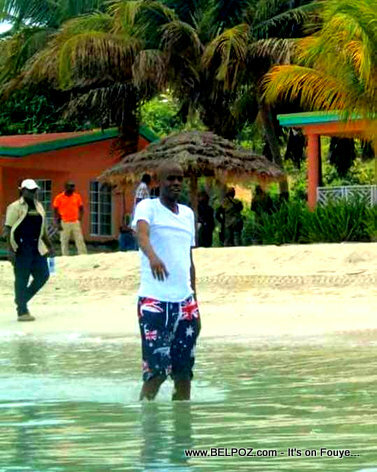 Mr President Jovenel Moise -- whom I assume is under a lot of stress these days -- decided to splash his feet in the blue ocean waters of Abaka Bay Beach Resort in Ile-a-Vache Haiti. Epi, sa w tande a... KRITIK!!!! President jovenel was criticized for wearing beach shorts with The Union Jack in it... The Union Jack, or Union Flag, is the national flag of the United Kingdom. Can a man get ever get break? Lè w prezidan w a konprann! Haitian journalist Luckner 'Louko' Desir said in his radio show "even is president Jovenel wore blue and red shorts he would be criticized "
Haitian presiden Jovenel Moïse visited Police Chief Michel-Ange Gedeon (DG-PNH) to the Direction générale de la Police nationale d'Haïti (PNH) Tuesday, July 31 2018 putting an end to rumors of a beef between chief of State and the police chief. President Jovenel Moise said during this visit that he and the Police chief Michel-Ange Gedeon maintain very cordial relations. "Me and DG-PNH, we are in constant communication. 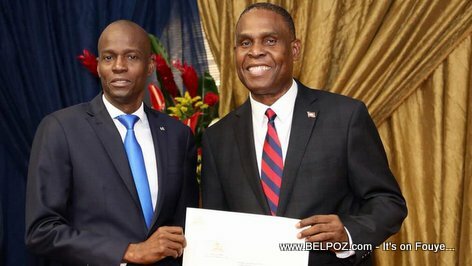 We speak almost every day about the strategies to be put in place to fight against banditry, insecurity and keep a climate of peace in the country," President Jovenel Moise said. Here is a photo of Haitian president Jovenel Moise ant the High command of the National Police of Haiti (Le Haut commandement de la Police Nationale d'Haïti) at the Direction générale de la Police nationale d'Haïti (PNH) Tuesday, July 31 2018. The chief of State paid them a visit. 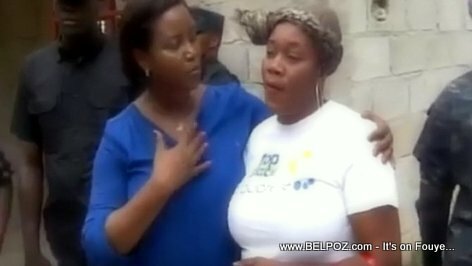 Haitian First Lady Martine Moise visited her neighbors Pelerin 5 on July 27 2018, the neighbors houses whose house were torn down earlier in the month and who blamed president Jovenel Moise for that happened. Watch the video as the first lady walked on foot in the neighborhood of Pelerin 5 to meet some of the neighbors. Martine Mose says: back in 2012 the government knocked down these houses, recently it happened again except this time, the opposition turned it to their advantage by saying it's President Jovenel Moise who sent people to do this because president Jovenel Moise does not want poor people around him. "Me and the president are from the countryside," Martine Moise said, "I am from Andro outside Chansolme and the president is from Trou-du-Nord so what sence does it make for people like us to say we don't want poor people around us? We come from the lower class (klas pòv la)." "It is the poor who voted for my husband to become president and that's why today I can call myself First Lady. If they have a problem I have to help them. that's why today I made time to come see what is happening."